This time last year, following much (internal) debate, we celebrated the day of Benny Goodman’s birth. Now, come May 30th once again, it’s time to give Mr. Frankie Trumbauer his time in the spotlight, on his 115th birthday. Frankie Trumbauer was born of Cherokee heritage in Carbondale, Illinois on May 30, 1901, the son of musical director. Tram took up the C-melody saxophone, and played early on with Ray Miller and Edgar Benson, and the Mound City Blue Blowers. He later became an important member of Jean Goldkette’s orchestra around 1926, and brought Bix Beiderbecke along with him. While working with Goldkette, and later with Paul Whiteman, Trumbauer led his own orchestra on a series of legendary jazz records for Okeh, with Bix, Eddie Lang, and other important jazzmen often in the band. Much of the music he recorded in that period is considered a predecessor to cool jazz. After finishing his engagement with Okeh, Trumbauer’s orchestra recorded for a number of other labels. During World War II, Tram took leave from music to fly for North American Aviation. After the war’s end, he continued to record sporadically, but never so much as he had before. Frankie Trumbauer died of a heart attack in Kansas City, Missouri in 1956. Okeh 40843 was recorded May 13, 1927 in New York City. The band features the astounding talent of Bix Beiderbecke on cornet, Bill Rank on trombone, Frankie Trumbauer on C-melody saxophone, Don Murray on clarinet and baritone sax, Don Ryker on alto sax, Irving Riskin on piano, Eddie Lang on guitar and banjo, and Chauncey Morehouse on drums and harpophone. Perhaps one of the most important and influential sides by Tram and Bix is “I’m Coming Virginia”, with Eddie Lang’s distinctive guitar adding a great deal to the already outstanding ensemble. 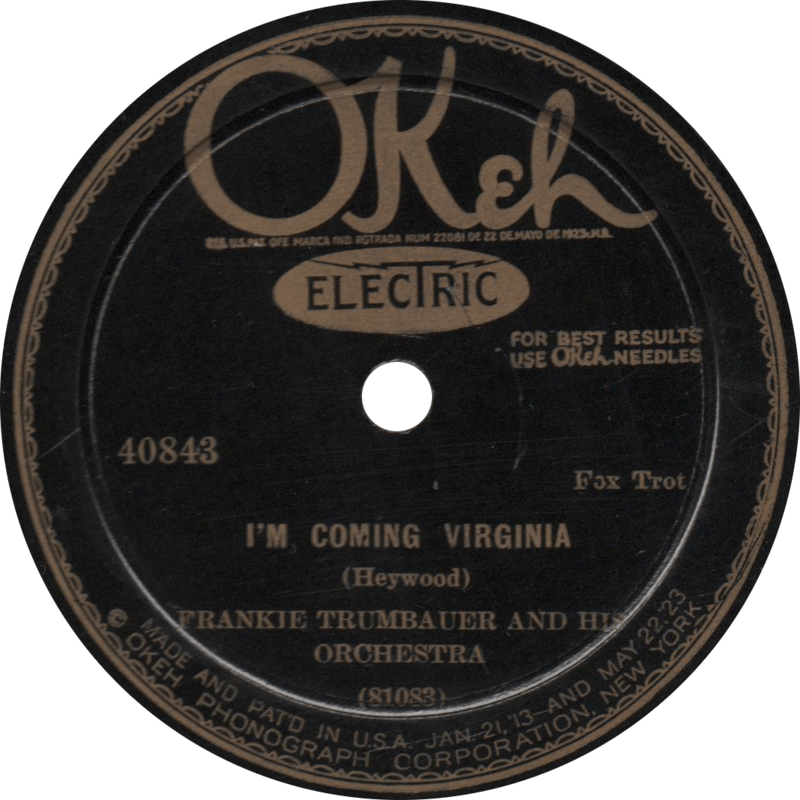 I’m Coming Virginia, recorded May 13, 1927 by Frankie Trumbauer and his Orchestra. On the flip, the Creamer and Layton standard “Way Down Yonder in New Orleans” is given superb treatment by Tram, Bix, and the gang. Unfortunately, this side is marred by a tight but troublesome crack that causes some thumps and clicks. 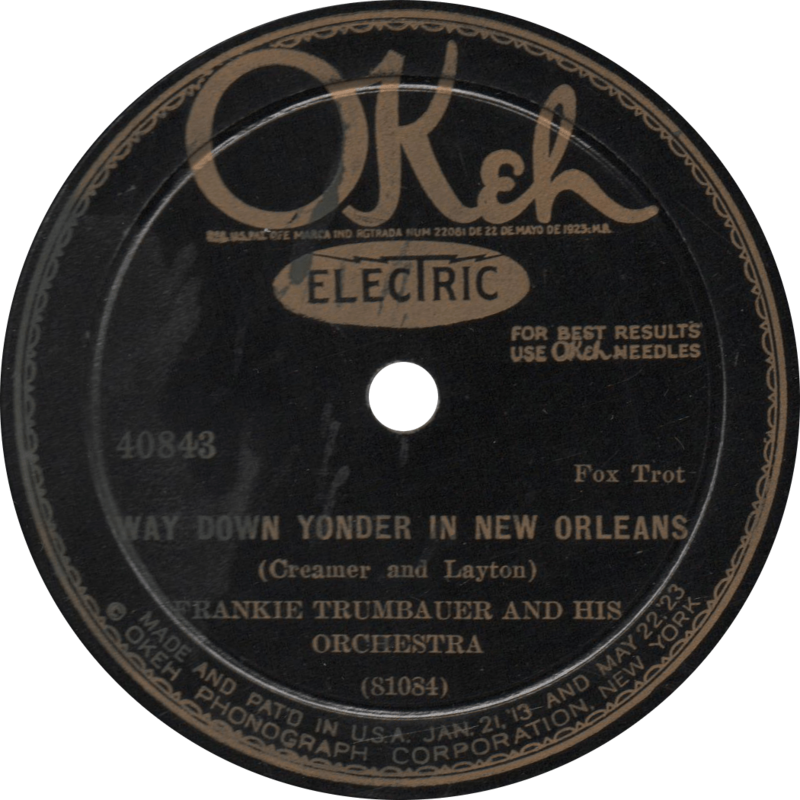 Way Down Yonder in New Orleans, recorded May 13, 1927 by Frankie Trumbauer and his Orchestra. This entry was posted in Records and tagged 1920s, 1927, Bill Rank, Bix Beiderbecke, Chauncey Morehouse, Don Murray, Don Ryker, Eddie Lang, Frankie Trumbauer, Henry Creamer, Irving Riskin, Jazz, New York, Okeh, Turner Layton by R. Connor Montgomery. Bookmark the permalink.